2019 KALAGNY Gala Invitation Packet. All dates are subject to change. Contact committee or program chair(s) for up-to-date information. KALAGNY is able to recognize and support its law student members due to our attorney members' generosity year after year. Whether during Gala season or any other time of year, KALAGNY welcomes donations to the Law Student Scholarship to ensure that we continue this tradition of supporting the next generation of KALAGNY leaders. Please donate here and note "Law Student Scholarship" in the Description box. We will recognize our generous supporters in our Gala Booklet to thank you for your support! 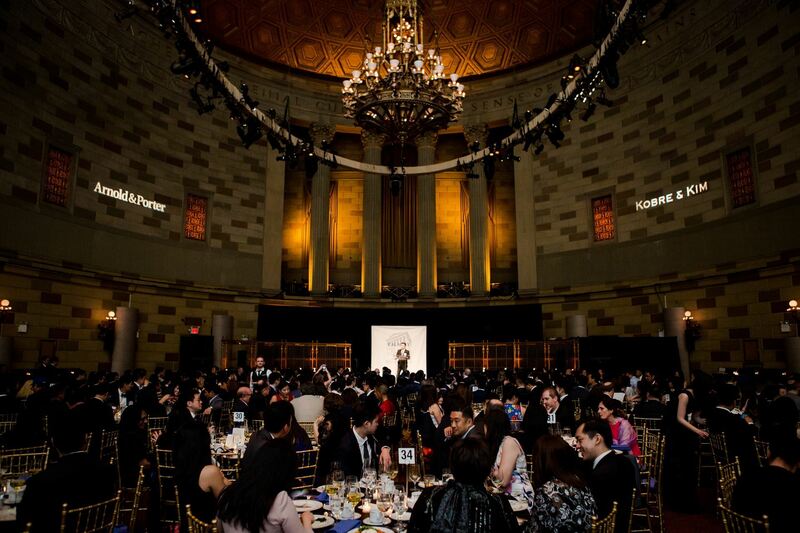 KALAGNY's elections and annual membership meeting will take place on the evening of April 18, 2019, 6:30 pm-9:00 pm at the Museum of Korean American Heritage in Manhattan (map). All are welcome to this event but only eligible members may vote. Please RSVP here for the annual meeting and elections. For this year's ballot and information regarding the Nominations Committee's slate of candidates, please click here. A portion of the proceeds from this event will be donated by KALAGNY to the Han C. Choi Scholarship Fund to support law students and lawyers affected by cancer. Photos from KALAGNY's 32nd Anniversary Gala are now posted in our Gala Photo Gallery! To view the photos, please click on the gallery link below and enter "trailblazer" as the password. Please save the date for next year's Gala! Joon H. Kim, Esq., Former Acting U.S. Attorney for Southern District of New York. Thanks also to Sung Hwang (KALAGNY member, AABANY Military and Veterans Affairs Committee Co-Chair and NYCLA Asian Practice Committee Co-Chair) and Margaret T. Ling (KALAGNY member, NYCLA Asian Practice Committee Co-Chair and AABANY Development Director) for organizing and Venable LLP for hosting. 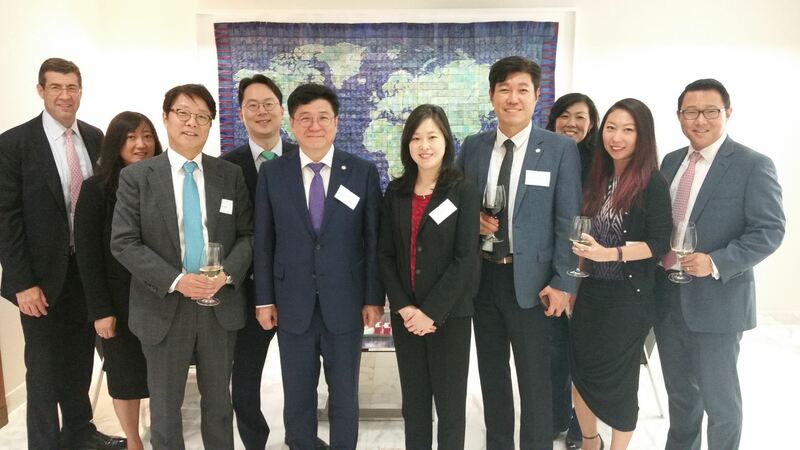 KALAGNY members and friends enjoyed a wonderful evening at our Annual Meeting and Elections on April 18 at the Korean American Association of Greater New York's (KAAGNY) Museum of Korean American Heritage in midtown Manhattan. Very special thanks to the Honorable Gilbert Hong for administering the oath of office and for his warm and inspiring remarks. Thanks also to EJ Thorsen, Executive VP, for organizing and KAAGNY/MOKAH for hosting. Congratulations to our newly-elected and re-elected Governors: Hon. 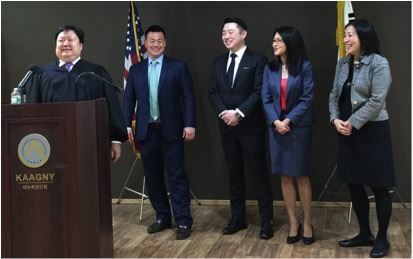 Judy H. Kim, J. John Kim, James Y. Lee, Chul Pak, and Maria Park, who were each elected to two-year terms beginning July 1, 2018. We look forward to working together! On January 18, KALAGNY, together with KoreanAmericanStory.org and KAAGNY (Korean-American Association of Greater New York), held a private preview screening of the documentary film Jeronimo with Director/Producer (and attorney) Joseph Juhn. Jeronimo presents the life of Jeronimo Lim Kim, a third-generation Korean-Cuban who became a political activist in Cuba during a period of rampant political corruption and social violence. At the same time, Jeronimo tells the larger story of the incredible unsung history of Korean-Cubans, including their noble fight against slavery, systematic discrimination, and social biases in Mexico and Cuba in the early 20th century. After the screening, attendees had the opportunity to discuss this remarkable film with Director/Producer Joseph Juhn, who shared some of his personal story in getting this film made against the odds. Thanks to our Executive VP EJ Thorsen for chairing the event and to our co-hosts for their efforts in bringing this evening together. We are especially grateful to Joseph Juhn for sharing with us his inspiring work. We were pleased to have so many friends join us for our Annual Holiday Party, held this year at Spoon Table & Bar in Manhattan. The venue was at capacity, which of course meant maximum merriment. Best of all, we were able to combine the festive side of the holiday with the giving side, with attendees bringing toys and winter clothing for children served by the Korean American Family Service Center. Thanks to Iris Jun, our Treasurer, whose efforts made it all possible, and thanks to all who made it out - hope to see you again at our next event! This year's holiday season kicked off with an extra helping of good cheer at KALAGNY's 2nd Annual Pre-Thanksgiving Dinner at NYU Law School’s Vanderbilt Hall. Nearly 200 law students and attorneys attended this year’s event, which featured an exquisite spread of Korean fare. KALAGNY’s immediate past president, Bridgette Ahn, who chaired the event last year, reminded us with her remarks how grateful we are for every opportunity to gather together in friendship with a shared sense of purpose. Veterans and Military Networking Event! On November 8, 2017, members of at least four branches of the U.S. armed forces (next time, Coast Guard better represent!) and a dozen bar associations attended the Veterans and Military Networking Event hosted by KALAGNY. In the Q&A session with our featured speaker, Justice Randall T. Eng, Presiding Justice of the App. Div., 2nd Dept. (fielding questions from Iraq veteran, Army Reserve Soldier, KALAGNY member and law firm partner Brian Song), we were given insights from the perspective of a lifetime of exemplary service. Attendees then spoke of their own military service and participation in organizations and committees dedicated to veterans, and discussed the ongoing need for pro bono services for veterans and legislative proposals designed to assist in the transition from active duty. 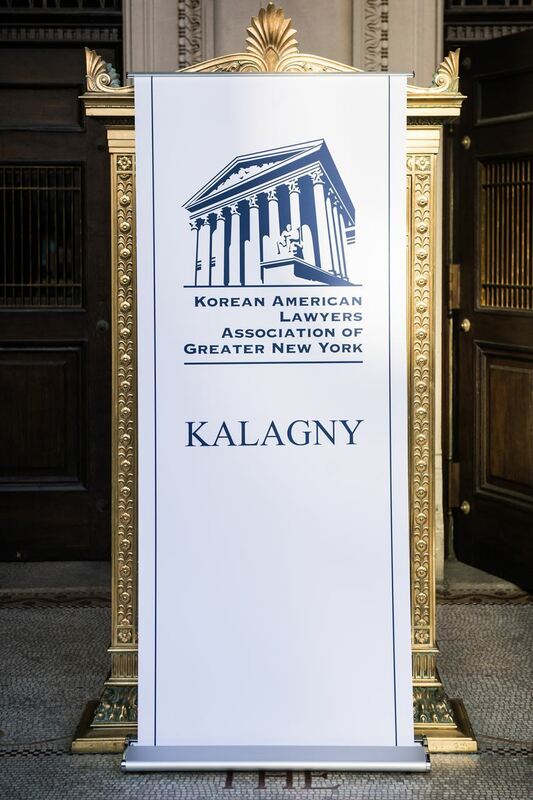 KALAGNY would like to thank Justice Eng, our gracious hosts at Lee Anav Chung White Kim Ruger & Richter LLP and our co-sponsors at AABANY, FALA-NY, MBBA, PRBA, SABANY, LeGaL, APALA-NJ, MuBANY, NoBL, NYC Bar Military Affairs & Justice Committee, and NYCLA who joined us wholeheartedly in bringing this event together. We hope this event will be the first of many of its kind. Finally, we are grateful to all of our veteran and current service member attorneys. Your sacrifices and dedication set an example for any member of our profession who seeks to perform, to the utmost degree, the duties of a citizen and an officer of the court. Thank you. Mentorship Program Co-Chairs Julie Cho and John Kim organized this year's Mentorship Program Kick-Off Reception, graciously hosted by Troutman Sanders LLP on October 25. A diverse crowd of mentors and mentees, ranging from seasoned attorneys to newly minted associates, as well as a large contingent of law school students, gathered to network and discuss mentorship over drinks and hors d'oeuvres. Remarks and advice were given by long time KALAGNY member and former committee co-chair Grace Yang. The Mentorship program has grown tremendously over the last few years, with more than 250 participants this year. Over 100 of those participants attended the Kick-Off Reception. The Mentorship Committee thanks everyone for their participation and support and looks forward to another great year! 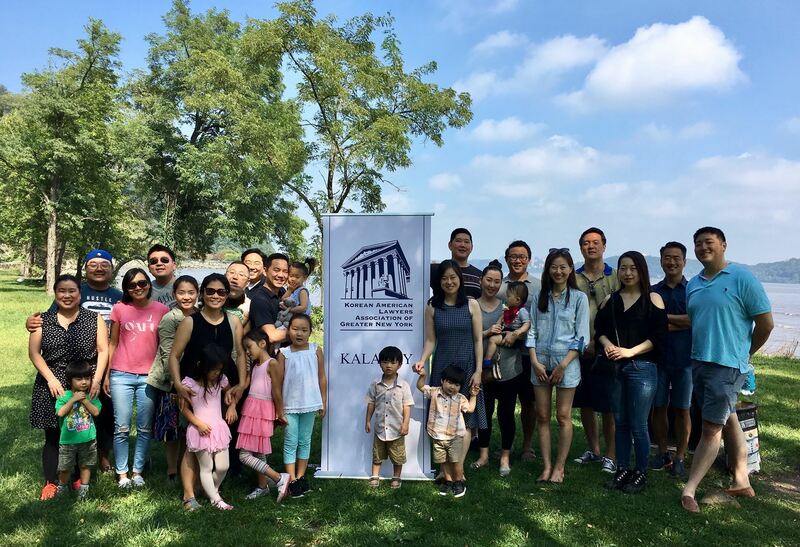 Thanks to Gene Kang for organizing KALAGNY's Annual New Jersey Picnic at Carpenter's Grove this past Saturday. And thanks to Donovan Cho and Charles Cho for their grilling skills. Friends and family of all ages enjoyed good food, great company, including former and current KALAGNY leadership, perfect weather, beautiful views and the petting zoo from Eyes of the Wild! The Mentorship Program Committee (Co-Chairs, Julie Cho and John Kim) held its annual Interview and Resume Workshop on August 28. The evening, which was hosted by Duane Morris LLP, kicked off with a meet and greet for mentors and mentees, followed by opening remarks by Andy Hahn of Duane Morris and Michael Yim of Sedgwick LLP to provide some insight into the interview process. Each mentee engaged in two mock interviews, each with a different senior attorney. After each interview, the senior attorneys gave feedback on interview style, approach to questions, and the resume. (There appears to be have been at least one mock interview that will lead to the real thing!) The Mentorship Program Committee thanks everyone who participated, and looks forward to another successful program later this year. Click here to learn more about our Mentorship Program. KALAGNY Wins the First Annual Minus One Norebang Karaoke Showdown vs FALA-NY! On August 16, 2017, history was made at Karaoke City. 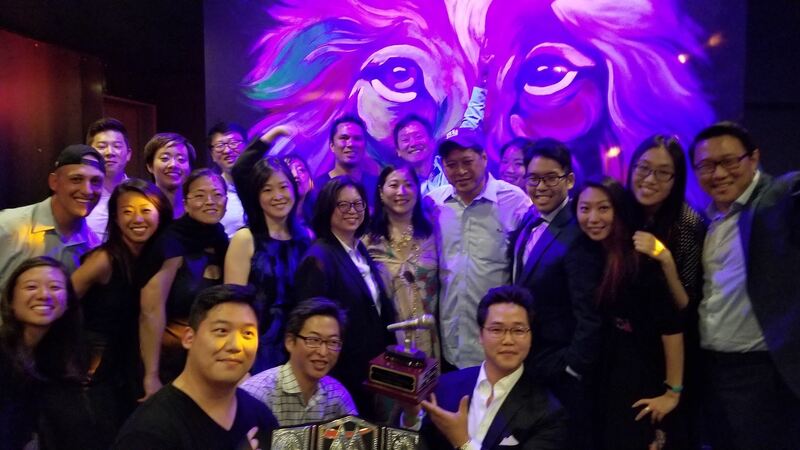 KALAGNY's crew of belters, crooners and N'Sync-style dance machines brought their A+ game and took home the trophy from the First Annual MON Karaoke Showdown against FALA-NY's no-holds-barred karaoke superstars! Many thanks to our event chairs, Iris Jun and Rose Yan, our intrepid KALAGNY singers, all of our dedicated volunteers, but most of all, to our friends at FALA-NY for being such great competitors and so much fun every step of the way! We're already planning the Second Annual, so stay tuned! On August 11, KALAGNY officers met with a delegation from the Seoul Bar Association that had just arrived in NYC for the ABA Annual Meeting. The meeting took place at the offices of Kobre & Kim, and was joined by the firm’s co-founder, Steve Kobre. Among other topics, the attendees discussed the current legal market in Korea and some of the factors underlying recent changes in legal practice. We look forward to continuing the discussion with our colleagues in Seoul. Special thanks to Kobre and Kim for hosting. KALAGNY's Women's Committee thanks Lee Anav Chung White Kim Ruger & Richter LLP for hosting our "Mini-Facials and Margaritas" event! 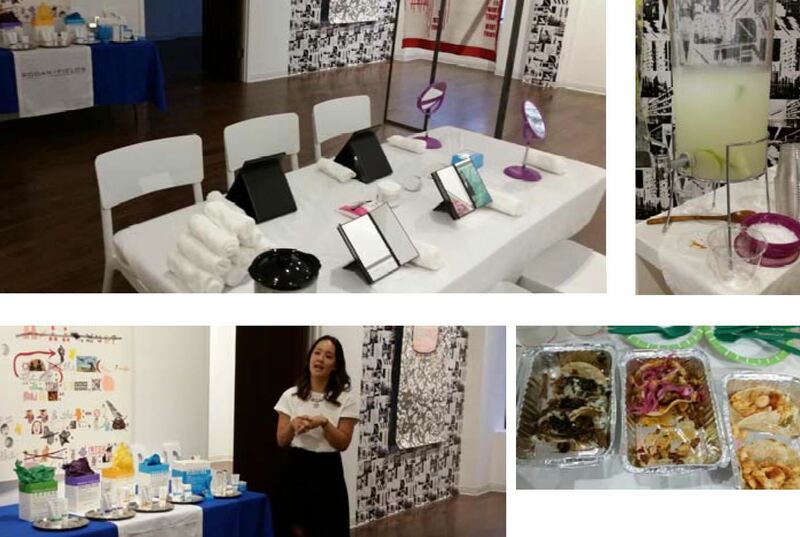 Jennifer Song talked about some amazing skincare products and attendees enjoyed sampling, having mini-facials and unwinding with margaritas and food from Tacombi. Thanks to Karaoke City for hosting KALAGNY's Annual Picnic on Saturday, July 29! Despite the drop in temperature (and no rain! ), everyone enjoyed seeing old friends, making new friends and having fun with games and good food. 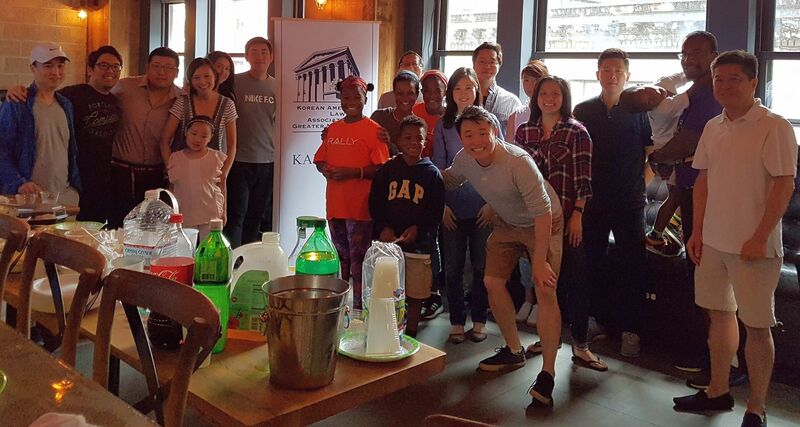 KALAGNY officers and Board members (Iris Jun, Jay Min, Suyon Yi, Chul Pak and Michael Rhee), 2017 Gala Planning Committee Senior Chair, David Sohn, as well as Denise Sharperson (Assistant General Counsel and Director of Diversity Initiatives, New Jersey State Bar Association) joined in on the fun. Thanks to James Lee for organizing a terrific gathering, Iris Jun for finding our venue and Jay Min for helping out. Looking forward to seeing everyone at our NJ Picnic in September! Stay in Touch with Your Group! Congratulations to the mentoring program committee on re-launching KALAGNY's mentoring program for the 2017-2018 year. Please learn about the program here! Mentoring program participants must be dues paid members of KALAGNY in order to participate. We encourage program participants to continue reaching out to their mentoring groups, so that we may make the program a tremendous success! *KALAGNY is an affiliate of the National Asian Pacific American Bar Association (NAPABA). KALAGNY members may activate an NAPABA affiliate membership (or renew an expired membership) at any time. Each Affiliate and National Associate member of NAPABA must activate his/her NAPABA membership in order to take advantage of NAPABA membership benefits, including event registration discounts and voting in officer elections. Go to KALAGNY's membership section to learn more about this members-only benefit. Learn more about NAPABA here.